Haddonfield’s Mike DePersia goes up for a driving layup against Lower Cape May. It would have been easy for Haddonfield to think the South Jersey Group 2 championship game had been won on Saturday. Instead, on that day the Bulldawgs just earned the right to compete for a title with a 54-53 overtime win over six-time defending sectional champion Camden. 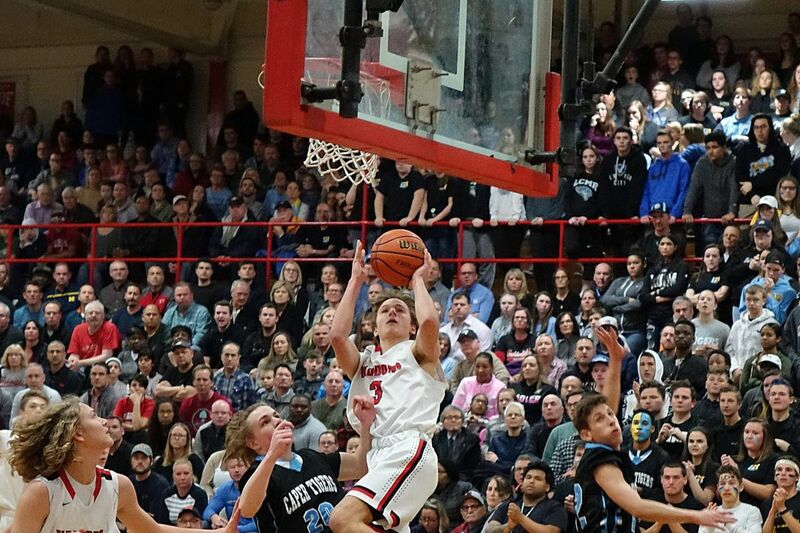 "I am not going to lie to you, it was hard not to enjoy that one," Haddonfield point guard Mike DePersia said. Yet the enjoyment stopped long enough for the Bulldawgs to get down to business early, not to be full of themselves as the favorite in the South Jersey Group 2 final. Any thought of a letdown ended quickly when Haddonfield scored the game's first 12 points and was never seriously threatened during a 63-45 win over Lower Cape May in the South Jersey Group 2 championship game Monday night before a packed house at Cherry Hill East. Second-seeded Haddonfield (27-3) will meet Rumson in the state Group 2 semifinal Wednesday (weather permitting) at Perth Amboy. Haddonfield was motivated more by fear. Had the Bulldawgs lost, that classic win over the Panthers would have seemed hollow. "The Camden win was so emotional, but we knew the job wasn't done," said junior forward Aiden Blake, who had a team-high 16 points in the sectional final. "We knew Lower Cape May got here for a reason." And Lower Cape May knew the same about Haddonfield. "They have a great team, play great defense," Lower Cape May coach Scott Holden said. One thing that kept the Bulldawgs motivated is that Lower Cape May has an explosive backcourt with freshman Martin Cottrell and 2,000-point scorer Pat Holden, the nephew of the coach. DePersia guarded Holden, but junior defensive stopper Lewis Evans also came in and displayed some stifling defense. Holden scored 19 points, but DePersia and Evans made him work for every shot. Evans knows more than a little about defense. He was a starting linebacker on Haddonfield's South Jersey Group 2 title team in the fall. "It's a great feeling to win both," he said. Both teams won because they kept improving as the postseason went on and never took an opponent for granted. Some might call this anticlimactic after the Camden win, but don't tell that to the players. Another motivating force was bringing a title back to town. Haddonfield last won a sectional boys' basketball championship in 2007. "We wanted to bring the title back to Haddonfield, it's been 11 years," said junior forward Dan Fleming, who had nine points. Rest assured, as happy as Haddonfield was, by Tuesday's practice, this team will have just one thought: earning a berth in the state final. "It's far from over," Fleming said. "We are trying to go all the way." L: Pat Holden 19, Martin Cottrell 3, Pat Moore 9, Justin Candelaria 7, Khamar Matthews 7. H: Mike DePersia 10, Lewis Evans 7, Aiden Blake 16, Dan Fleming 9, Dylan Heine 7, Will Bond 14.